Norie Neumark and Maria Miranda (Out-of-Sync) have maintained a collaborative art practice for over 20 years. Engaged with questions of culture, place and memory, our practice draws provocations, ideas and material from literary texts and popular cultural forms such as film, TV and music – understanding these different cultural forms as ciphers to even greater mysteries. We treat ourselves as (art) mediums – always deep in a state of trance-like séance – passing on these strange disturbances and unclear sightings/sitings that emanate from the vast cultural unconscious. The work that emerges can take many forms, but mostly video, sound and installation. 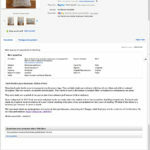 As we describe on Ebay, our work around neoliberal aesthetics emerged after Norie was made redundant, which made us experience painfully what we had always understood as a brutal regime and political ideology, usually referred to as ‘neoliberalism’. 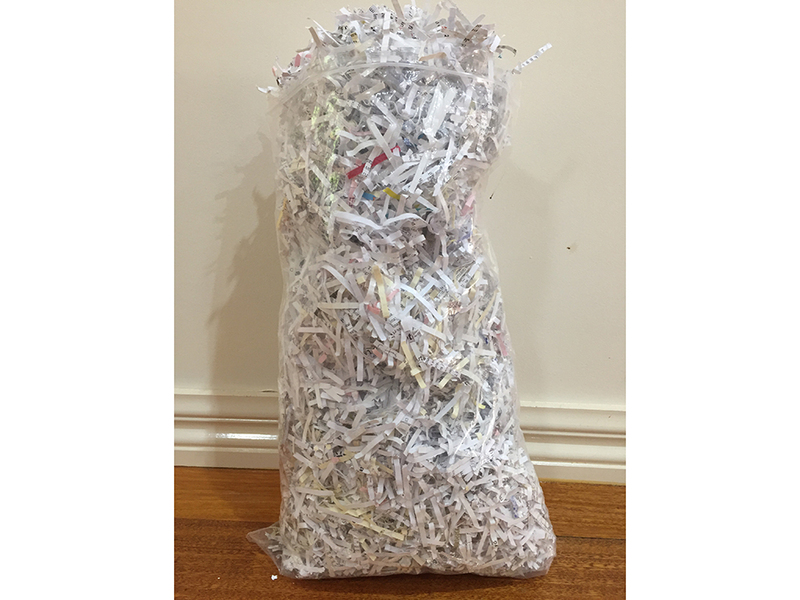 The “shreds” are a material result or evidence of a year’s labour shredding every piece of text attached to our time at Latrobe University including filing cabinets full of Norie’s decades long teaching career. We also made a series of video performances, performing with the shreds and using the Three Stooges as masks to channel the violence underlying current social transactions. (Wendy Brown, Undoing the Demos). The Three Stooges understood all too well the affect of humiliation and violence with their heads hammered, eyes poked, hands sawed, and other physical acts displaying the force and power against the little guys. Their zany slapstick (Sian Ngai, Our Aesthetic Categories) reverberates today with the neoliberalism which animates every particle of our everyday life, politics and culture. It is so pervasive that we take its violence and cruelty for granted, as inevitable. 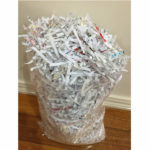 In our art work of shredding and with shreds, we set out to carry the aesthetics of neo-liberalism to the extreme, so they may be visible, audible, tangible. 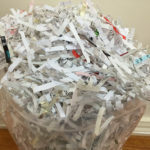 In other words, the shreds speak to the extreme and radical shifts in social values that have occurred over the past 40 years and act as both material evidence and as metaphor for these ‘empty’ financial values. 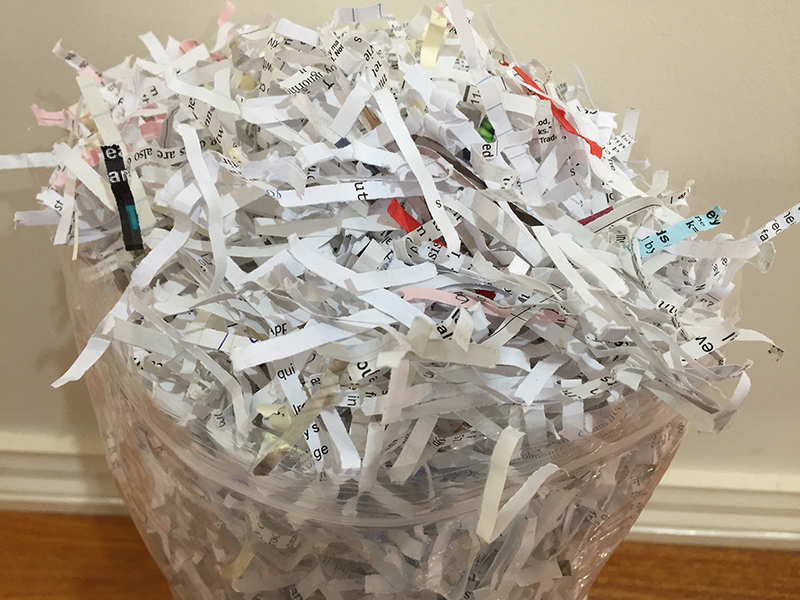 Having filled a number of installation sites* with our shreds, we were reluctant to let them go, and like the Three Stooges, they just keep popping back up. 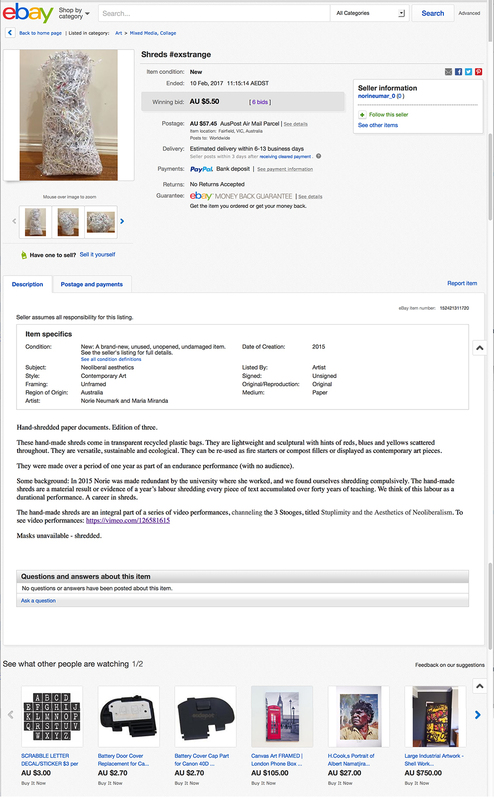 When we were invited by #exstrange to auction our work on Ebay— “to unmask the farcical nature of financial systems”—it seemed a timely minor gesture (Erin Manning, The Minor Gesture) to express the way our value system has been reduced to money and financial exchange. A fitting dénouement in the process the shreds have been through, a process which itself reflects the way the financial system reduces everything to money, that is, the papers that were produced by (now redundant) teaching labour were shredded but then revalued by art labour but now art labour itself is reduced to financial monetary value by Ebay. 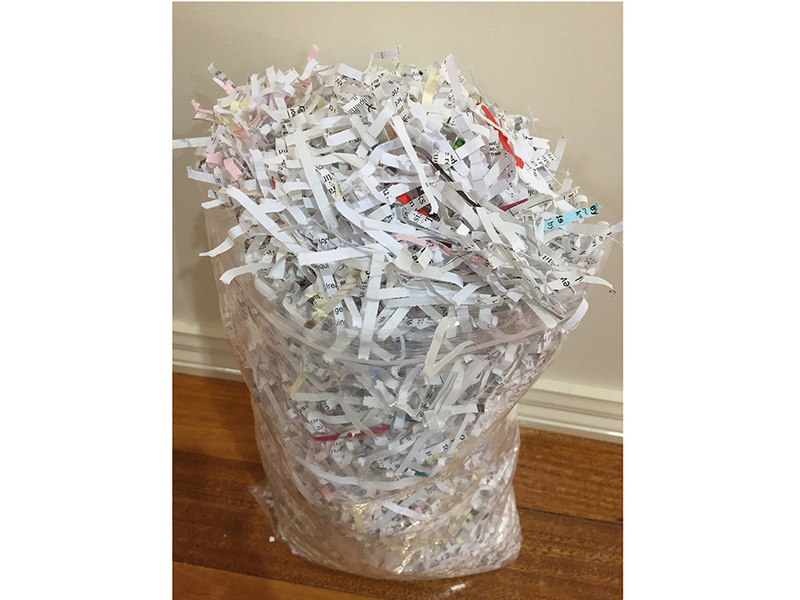 *these shreds have been part of three installations so far: AirSpace, Sydney November, 2015. Blindside, Melbourne, July 2016 and at The Avoca Project, Victoria, November, 2016. 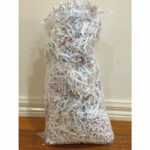 The video, Shredded has been shown by Mars Gallery and Blindside at Fed Square, Melbourne, and Melbourne Central as part of Play2 ongoing.